Thomas Solutions has been an industry leader in providing commercial trucks for lease and rental, cartage, manpower, and custom solutions for over 40 years. We also offer customized trucks to suit your business needs. Whether you need stock options or custom flatbeds, Thomas Solutions will work with you to find the best transportation setup tailored to your operations that will allow you to increase your business productivity. One of our clients, Gelderman Landscape Services, approached us for an outfitted truck suited for their landscaping business. Their company offers landscape care and maintenance, property enhancements and construction, and snow and ice removal. They needed a specific type of truck that can haul large equipment and also powerful enough to tow machines, if necessary. 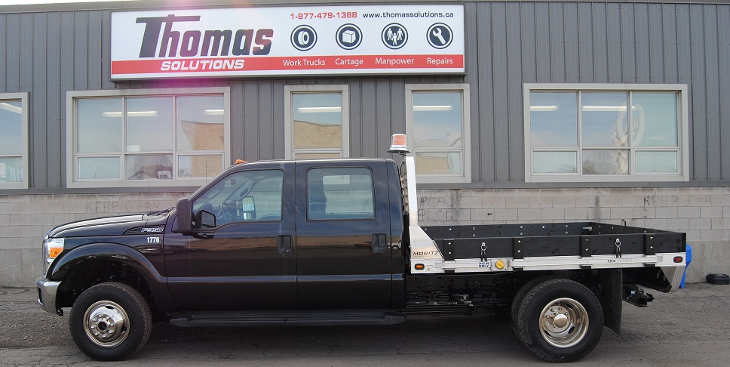 Thomas Solutions retrofitted a 2015 Ford F-350 4×4 Dually in aluminum flat deck with tie down and side rails. Our custom design provided the necessary capacity increase and enhanced towing capability that could meet Gelderman’s requirements. Do you need work truck rentals for your business? With a fleet of over 800 vehicles and growing, Thomas Solutions has a wide array of work vehicles for lease or rent. Thomas Solutions can outfit your work trucks anyway you want. Many of our clients have specific Health & Safety or site requirements, including things such as first aid kits, fire extinguishers, and back-up horns. We also have a liberal “dent, dings, scratch” policy. We understand our products are work trucks and don’t charge for minor dents, dings, or scratches. We provide truck leasing in Hamilton, Niagara, GTA, or anywhere in Southern Ontario for that matter. We would welcome the chance to see if we can help you with your fleet management or fleet leasing needs. Contact us today.